Musa serpentina Swangpol & Somana is named after the sinuous shape of its rachis. Its Thai vernacular name, Kluai Nakkharat (กล้วยนาคราช), means the serpent king banana, kluai being the Thai word for banana. The species, described in 2011, was found in western Thailand, in an area where Musa acuminata and Musa laterita are also present. Because Musa serpentina possesses characters of both of these species, it has been suggested that it is a hybrid rather than a species. The inflorescence is erect at emergence, but as the rachis lengthens it takes on the distinctive snake-like shape after which the species is named. The plant is between 2–4 m tall and the circumference of the pseudostem is 20–40 cm. The margins of the petiole canal are curved inward. The male bract is pink-purple to purple-brown on the outside, and red-purple with or without purple streaks in the inside. There are 4–7 hands per bunch and 8–18 fruits per hand, in two rows. The authors use the TS ratio (the vertical depth of the petiole canal divided by the vertical depth of petiole tissue beneath) to distinguish Musa serpentina (TS ratio less than 1) from Musa laterita (TS ratio more than 1). The species was found in the western part of Thailand (Mae Hong Son, Mae Ramat, Sangkhla Buri) along the border with Myanmar. It has been observed in open mixed deciduous forest along stream banks and roadsides, and at altitudes varying between 240 and 570 m.
1. Swangpol, S. and Somana, J. 2011. 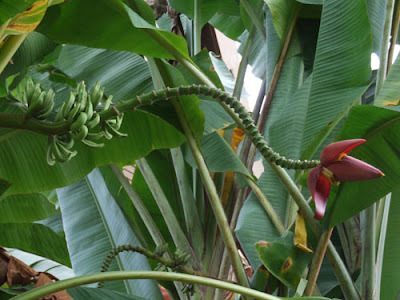 Musa serpentina (Musaceae): a new banana species from western border of Thailand. Thai Forest Bulletin 39:31-36. 3. Argent, G.C.G. 1976. The wild bananas of Papua New Guinea. Notes from the Royal Botanic Garden 35(1):77-114. Page last modified on Tuesday, 13 September 2016 14:59:13 CEST by System Administrator.